Kathy Sprau - What people say! It Is All About Me … I Can Make A Positive Difference! ”As a former student of J. H. Rose High School, my life was deeply impacted by the speech you delivered at our Academic Banquet. Standing in front of my peers and myself was the most dynamic speaker I had ever heard during my four years at J. H. Rose High School. With your energy and positive outlook, you held our attention by relating stories and directly involving the audience. I have learned that having a positive outlook on life is what makes life’s wonderful times enjoyable and life’s difficult times bearable. From the positive reaction I saw to your speech, I am sure that my peers will remember the same message and put it top work in their lives as well. I am forever grateful to you for making me aware of the influence of words and thoughts." 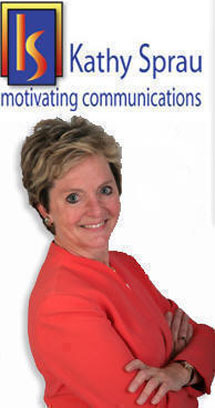 “Kathy Sprau conducted a day long motivational seminar around 3 ½ years ago. My employees are still using buzz words, etc. She really made an impressive impact. She was great! We love her! My employees are still using what they learned. Dept. of Health Services and Info Mgmt. “You are such a good speaker that you inspired me to do something I have been putting off. Just wanted to let you know that you are appreciated and deserve a “standing ovation”! How to Talk So Others Will Listen: Full Day! in my office. I could almost go through the class again! It was so much fun! "Kathy was very energetic and funny! The seminar was well worth coming to for any who wants to better themselves!" "Kathy kept my attention very well and made things interesting. She was able to break it down so that anyone could understand it. She didn't just blow it off and leave us to hope we got it. I liked the way she used real world examples. “Kathy did an outstanding job with her presentation. She was well prepared and organized. I found her to be personable with all those attending and interacted with them with professional knowledge and a sense of humor. Kathy answered questions as well as presented new ideas and strategies for coping with “complainers” that could easily be put into action. Lentz Stowe, Director Small Business Ctr.